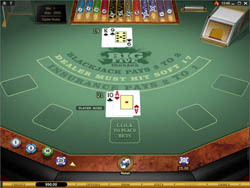 In Big Five Blackjack, the dealer has to hit on a soft 17. You may split any two cards. Aces may be split only once, and receive one more card each before you must stand. If you split two aces, or any pair of cards containing an ace, then you draw a card with a value of 10, it counts as 21, not blackjack. Re-splitting is allowed, up to 3 times to make a total of 4 hands. Doubling down is allowed on any first 2 cards. The double down bet is always equal to one half of your original bet. You may double down after a split, but you may not double down if you have blackjack. An insurance bet can be made on any first hand (not after a split or double down) when the dealer shows an ace. If the dealer gets blackjack you are paid out 2:1, but if the dealer does not, you lose your insurance bet. Surrender is available at the cost of losing one half your original bet to gain the right not to continue playing your hand. Bets use one of eight chip sizes – 1, 5, 10, 25, 50, 100, 200, and 500. Max original bet for every hand is 500 USD/Euro/GBP. Blackjack pays out at 3:2 on your original bet. If you hand totals closer to 21 than the dealer’s hand, but you do not have blackjack, you are paid out at 1:1 on your original bet (basically, you get your bet back). If the dealer gets blackjack and you placed an insurance bet on his ace, your insurance bet (half of your original bet) pays out at 2:1. As one of Microgaming’s Gold games, you can expect good things from Big Five Blackjack Gold. The graphics are enhanced to the highest level. Chips hover slightly over the plush green table when you move your mouse over them, and cards flip over as they are dealt. The subtle background music, which can be turned off if you like, adds a nice sophisticated touch to the game. While you get a great view of the table that takes up most of your screen, this does not leave much room for buttons. The main buttons for betting, dealing, hitting, and so forth show up when you need them, but the rest are very small and hard to read on the bottom of the board. It is a small price to pay, however, for such a classy, polished online blackjack game. If you want to take advantage of this game’s auto play feature, have a good look over the built-in strategy card. The default one is pretty good, but remember that you can customize it however you want! Adjust it to fit your favorite betting strategy, and then let the game play just as you would. The game records all hands, so you can go back and review them in real-time whenever you like. Big Five Blackjack looks and plays great. The subtle treats that come with the Gold version are noticeable, but never distract from the gameplay. With standard rules there is nothing new to learn – just join up, buy some chips, and enjoy a couple hours of realistic blackjack fun!